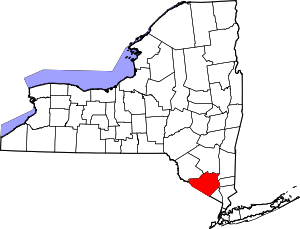 This is intended to be a complete list of properties and districts listed on the National Register of Historic Places in Orange County, New York. The locations of National Register properties and districts (at least for all showing latitude and longitude coordinates below) may be seen in a map by clicking on "Map of all coordinates". Eight of the properties or districts are further designated National Historic Landmarks of the United States. 41°26′47″N 74°00′59″W﻿ / ﻿41.4464303°N 74.0162616°W﻿ / 41.4464303; -74.0162616﻿ (Adams–Chadeayne–Taft Estate) Cornwall-on-Hudson Small residential complex remaining intact from village's resort era. 41°17′42″N 74°07′20″W﻿ / ﻿41.295°N 74.122222°W﻿ / 41.295; -74.122222﻿ (Arden) Harriman Home of railroad magnate Edward H. Harriman in the last years of his life. 41°31′57″N 74°00′46″W﻿ / ﻿41.5325°N 74.012778°W﻿ / 41.5325; -74.012778﻿ (Bloomer–Dailey House and Balmville Tree) Balmville Eastern cottonwood tree dating to ca. 1699, early center of Balmville and today New York's smallest state forest. Local legend has it that it was George Washington's walking stick. It was cut down in 2015 after it became a hazard to traffic. (#96001434) W side of NY 94, jct. with Old Dominion Rd. 41°34′25″N 74°11′52″W﻿ / ﻿41.573611°N 74.197778°W﻿ / 41.573611; -74.197778﻿ (Bodine Farmhouse) Town of Montgomery William Bodine was a grandson of Jean Bodine, but that the record of his birth has not been found. He was granted a large tract of land in Montgomery, outside the village of Walden, and his homestead was built in 1769 and occupied by several generations of his descendants, the last about 1908. 41°30′06″N 74°15′55″W﻿ / ﻿41.50157°N 74.26514°W﻿ / 41.50157; -74.26514﻿ (Bodine's Tavern) Town of Montgomery Rest stop on Montgomery and Minisink Turnpike (now NY 211) built in 1809 and expanded 1835; used until early 20th century. 41°26′25″N 74°02′22″W﻿ / ﻿41.440278°N 74.039444°W﻿ / 41.440278; -74.039444﻿ (Oliver Brewster House) Cornwall 1850 home of berry farmer later renovated for summer boardinghouse use with accessory farm buildings remaining; all mostly unaltered. 41°28′07″N 74°16′39″W﻿ / ﻿41.468611°N 74.2775°W﻿ / 41.468611; -74.2775﻿ (Bull-Jackson House) Campbell Hall 18th-century stone home of one of Thomas Bull's sons remained in family for almost two centuries. Today a county museum. 41°26′17″N 74°00′19″W﻿ / ﻿41.438056°N 74.005278°W﻿ / 41.438056; -74.005278﻿ (Camp Olmsted) Cornwall-on-Hudson Summer camp built in 1900 to allow children of New York's Five Points neighborhood to get fresh Hudson Valley air for a few weeks. 41°26′07″N 74°01′55″W﻿ / ﻿41.435278°N 74.031944°W﻿ / 41.435278; -74.031944﻿ (Canterbury Presbyterian Church) Cornwall Federal-style church used until the early 2000s. 41°22′24″N 73°57′54″W﻿ / ﻿41.373333°N 73.965°W﻿ / 41.373333; -73.965﻿ (Church of the Holy Innocents and Rectory) Highland Falls 1841 Episcopal church designed by Robert Walter Weir in memory of his children. Louis Comfort Tiffany stained-glass window depicting creation donated in memory of J. Pierpont Morgan, a congregant in summer months. (#80002735) Park Pl., Main and Webster Sts. (#98001343) 207 S. Plank Rd. (#96000153) Old Pleasant Hill Rd. (#05000017) Off of Maple Ave.
41°31′17″N 74°08′45″W﻿ / ﻿41.521389°N 74.145833°W﻿ / 41.521389; -74.145833﻿ (Colden Family Cemetery) Montgomery Final resting place of immediate descendants of Cadwallader Colden, area landowner and one of the last colonial governors of New York. 41°26′02″N 74°02′36″W﻿ / ﻿41.433889°N 74.043333°W﻿ / 41.433889; -74.043333﻿ (Cornwall Friends Meeting House) Cornwall Intact Quaker meeting house from late 18th century still in use. Oldest religious building in Cornwall. (#98001000) NY 302, 1 mile (1.6 km) northeast of the junction of NY 302 and Thompson Ridge Rd. 41°25′27″N 74°02′42″W﻿ / ﻿41.424167°N 74.045°W﻿ / 41.424167; -74.045﻿ (Cromwell Manor) Cornwall 1835 Greek Revival home of, among others, Joseph Sutherland, son of major early landowner. Today a bed and breakfast. One of the first large houses built in Cornwall not intended to be a farmhouse. 41°27′33″N 74°36′15″W﻿ / ﻿41.459236°N 74.604302°W﻿ / 41.459236; -74.604302﻿ (Delaware and Hudson Canal) Cuddebackville, Deer Park, and more Coal-carrying canal historic district that runs through other counties in New York and Pennsylvania as well. Key link in supplying New York City with anthracite coal in the 19th century. 41°27′43″N 74°06′23″W﻿ / ﻿41.46194°N 74.10649°W﻿ / 41.46194; -74.10649﻿ (Denniston–Steidle House) New Windsor 1875 farmhouse is a rare example of non-reinforced lime-based concrete construction in region. (#95001286) 171 W. Searsville Rd. 41°34′21″N 74°15′11″W﻿ / ﻿41.5725°N 74.253056°W﻿ / 41.5725; -74.253056﻿ (Abraham Dickerson Farmhouse) Montgomery Home built in late 18th century by migrant from Long Island. Later a boardinghouse and dance hall. 41°28′37″N 74°32′29″W﻿ / ﻿41.476944°N 74.541389°W﻿ / 41.476944; -74.541389﻿ (Dodge-Greenleaf House) Otisville Well-preserved Gothic Revival home of local businessman from mid-19th century; built when that style was very new. Later home to workers constructing the Otisville Tunnel, which runs beneath the property. 41°34′32″N 74°11′42″W﻿ / ﻿41.575556°N 74.195°W﻿ / 41.575556; -74.195﻿ (Dubois-Phelps House) Montgomery Greek Revival home of early Town of Montgomery settlers. 41°23′05″N 74°27′26″W﻿ / ﻿41.384722°N 74.457222°W﻿ / 41.384722; -74.457222﻿ (Dunning House) Wawayanda Late 18th-century house rebuilt and added onto in different, changing styles over the next century. 41°30′16″N 74°00′32″W﻿ / ﻿41.504444°N 74.008889°W﻿ / 41.504444; -74.008889﻿ (Dutch Reformed Church) Newburgh 1835 Alexander Jackson Davis church is his only surviving one in Greek Revival style, also his latest surviving church largely unaltered from his design. Currently the focus of intensive restoration efforts. Goshen (town) Artifacts from earliest known inhabitants of Wallkill Valley, 12,000 years ago, found in and around actively used quarry. (#85002426) Roughly bounded by Robinson Ave., LeRoy Pl., Water St., Bay View Terr., Monument & Renwick Sts. 41°30′05″N 74°00′47″W﻿ / ﻿41.501389°N 74.013056°W﻿ / 41.501389; -74.013056﻿ (East End Historic District) Newburgh Most contributing properties of any historic district in state, consisting of intact 19th-century buildings and homes. (#80002739) Jersey Ave. and Fowler St.
41°22′20″N 74°41′30″W﻿ / ﻿41.372222°N 74.691667°W﻿ / 41.372222; -74.691667﻿ (Erie Railroad Station) Port Jervis Old Queen Anne-style station built by Erie Railroad and used for passenger service until the 1970s. Today restored and used as professional offices. (#05001382) 35 E. Main St.
41°26′44″N 74°25′10″W﻿ / ﻿41.445556°N 74.419444°W﻿ / 41.445556; -74.419444﻿ (First Congregational Church of Middletown) Middletown One of the oldest buildings in contemporary Middletown, predating city's establishment. (#74001291) 127 W. Main St.
41°22′43″N 74°42′07″W﻿ / ﻿41.378611°N 74.701944°W﻿ / 41.378611; -74.701944﻿ (Fort Decker) Port Jervis Oldest building in Port Jervis, made from stones of demolished eponymous trading post. Currently used as local history museum. 41°19′26″N 73°59′13″W﻿ / ﻿41.323889°N 73.986944°W﻿ / 41.323889; -73.986944﻿ (Fort Montgomery Site) Fort Montgomery Site of unsuccessful Colonial stand against British. 41°19′34″N 74°16′50″W﻿ / ﻿41.326111°N 74.280556°W﻿ / 41.326111; -74.280556﻿ (Fury Brook Farm) Sugar Loaf First farm established on the old Wawayanda Path in 1731. Horses for Continental Army bred here. 41°25′32″N 74°01′14″W﻿ / ﻿41.425556°N 74.020556°W﻿ / 41.425556; -74.020556﻿ (Gatehouse on Deerhill Road) Cornwall Rare example of Norman Revival style gatehouse in Hudson Valley; today in use as residence. (#95000480) Old Pleasant Hill Rd. 41°31′34″N 74°10′34″W﻿ / ﻿41.526111°N 74.176111°W﻿ / 41.526111; -74.176111﻿ (Nathaniel Hill Brick House) Montgomery 1760s Georgian home built by Irish immigrant who had to import bricks from England as they were not then made in the area. 41°26′32″N 74°25′51″W﻿ / ﻿41.442222°N 74.430833°W﻿ / 41.442222; -74.430833﻿ (Hillside Cemetery) Middletown Calvert Vaux-designed cemetery is final resting place of many notable local residents from the 19th century. (#97000938) Old Grange Rd., south of the junction of Old Grange and Big Pond Rds. (#00001414) Old Pleasant Hill Rd. (#72000901) Quassaick Ave. and Forge Hill Rd. 41°28′09″N 74°06′35″W﻿ / ﻿41.469167°N 74.109722°W﻿ / 41.469167; -74.109722﻿ (Thomas McDowell House) New Windsor 1770s-era house is well-preserved home of one of Little Britain's original Irish American settlers. (#73001246) Montgomery, Grand, and Liberty Sts. 41°30′25″N 74°00′35″W﻿ / ﻿41.506944°N 74.009722°W﻿ / 41.506944; -74.009722﻿ (Montgomery-Grand-Liberty Streets Historic District) Newburgh 19th-century homes and churches of city's wealthier residents. (#96000557) NY 32, south of the junction with Creamery Rd. 41°25′13″N 74°38′02″W﻿ / ﻿41.4201588°N 74.6337786°W﻿ / 41.4201588; -74.6337786﻿ (Neversink Valley Grange Hall No. 1530) Huguenot Classic 1934 Grange hall was early community center. 41°30′03″N 74°01′17″W﻿ / ﻿41.500703°N 74.021358°W﻿ / 41.500703; -74.021358﻿ (Newburgh Colored Burial Ground) Newburgh Slave cemetery discovered during courthouse expansion. (#81000411) Broadway and Johnson St.
41°30′27″N 74°00′36″W﻿ / ﻿41.5075°N 74.01°W﻿ / 41.5075; -74.01﻿ (Old Town Cemetery and Palatine Church Site) Newburgh Burial ground of early Newburgh settlers features Robinson mausoleum, only Egyptian Revival tomb in the world with both a mastaba and a pyramid, possibly designed by Alexander Jackson Davis. (#10000336) 201 W. Main St.
(#08000409) NY 207 W. of jct. with Temple Hill Rd. 41°29′07″N 74°04′24″W﻿ / ﻿41.485294°N 74.073211°W﻿ / 41.485294; -74.073211﻿ (James "Squire" Patton House) New Windsor Well-preserved home of early landowner is excellent example of local vernacular styles; today used as Newburgh police K-9 training facility. 41°25′40″N 74°02′32″W﻿ / ﻿41.427778°N 74.042222°W﻿ / 41.427778; -74.042222﻿ (Patrick Piggot House) Cornwall Old farmhouse converted to boardinghouse during Cornwall's resort days. 41°31′21″N 74°01′02″W﻿ / ﻿41.5225°N 74.017222°W﻿ / 41.5225; -74.017222﻿ (Powelton Club) Balmville One of the five oldest golf courses in New York, and among ten oldest in U.S.
(#08001232) St. Andrew's Rd. and Plains Rd. (#08000513) 13 & 15 Walnut St.
41°21′40″N 74°06′40″W﻿ / ﻿41.361111°N 74.111111°W﻿ / 41.361111; -74.111111﻿ (Smith Clove Meetinghouse) Highland Mills 1803 Quaker meeting house still used once a year. Oldest religious building in the town and village of Woodbury. (#96000863) 2727 Albany Post Rd. 41°14′48″N 74°22′16″W﻿ / ﻿41.246667°N 74.371111°W﻿ / 41.246667; -74.371111﻿ (General John Hathorn Stone House) Warwick First built in 1773, home of general who led militia at Minisink Ford and later served in state legislature and Congress shows German influence on English building traditions. 41°26′00″N 74°02′15″W﻿ / ﻿41.433333°N 74.0375°W﻿ / 41.433333; -74.0375﻿ (Daniel Sutherland House) Cornwall Stick-Eastlake-styled house of descendant of early Cornwall landowner, on family lands. 41°25′50″N 74°02′21″W﻿ / ﻿41.430556°N 74.039167°W﻿ / 41.430556; -74.039167﻿ (David Sutherland House) Cornwall 1770 fieldstone house built by descendant of one of Cornwall's early landowners. (#97000568) Jct. of NY 302 and Thompson Ridge Rd. (#98000039) NY 302, south of the junction of NY 302 and Dickerson Ave.
41°12′05″N 74°12′24″W﻿ / ﻿41.201389°N 74.206667°W﻿ / 41.201389; -74.206667﻿ (Tuxedo Park) Tuxedo Park First gated community in U.S.
(#99001134) 263 Beaver Dam Rd. 41°30′27″N 74°13′42″W﻿ / ﻿41.5075°N 74.228333°W﻿ / 41.5075; -74.228333﻿ (Tweddle Farmstead) Montgomery Early 19th-century farmhouse renovated in Greek Revival style in the 1830s. 41°23′43″N 73°58′18″W﻿ / ﻿41.395278°N 73.971667°W﻿ / 41.395278; -73.971667﻿ (U.S. Military Academy) West Point Oldest continuously operated military post in U.S., and alma mater of many notable American generals and Army officers. (#12000958) Cornwall Yacht Club, Shore Rd. (#80004395) Roughly bounded by Ward St., Wallkill Ave., Sears and Hanover Sts. 41°22′30″N 74°41′33″W﻿ / ﻿41.375°N 74.6925°W﻿ / 41.375; -74.6925﻿ (US Post Office-Port Jervis) Port Jervis Colonial Revival building from the mid-1920s. (#98001391) Roughly bounded by Lake St., Carpenter Place, Clark St., Monroe Race Track Site, Ramapo St., and Oakland Ave.
41°19′28″N 74°11′09″W﻿ / ﻿41.324444°N 74.185833°W﻿ / 41.324444; -74.185833﻿ (Village of Monroe Historic District) Monroe Early 19th-century residential core of Monroe, mostly spared in 1892 fire. Little new construction since 1940. Contributing properties include birthplace of Velveeta and oldest Masonic lodge in New York. (#08000103) 125 W. Main St.
(#84002886) Roughly bounded by NY 17A, High, and South Sts., Oakland, Maple, and Colonial Aves. (#66000887) Liberty and Washington Sts. 41°29′52″N 74°00′39″W﻿ / ﻿41.497778°N 74.010833°W﻿ / 41.497778; -74.010833﻿ (Washington's Headquarters) Newburgh Oldest house in city of Newburgh was home to Washington during Continental Army encampment; later became first property in U.S. acquired by a state government for historic preservation purposes. (#98001118) 58 Pleasant Hill Rd. 41°24′40″N 74°04′25″W﻿ / ﻿41.411111°N 74.073611°W﻿ / 41.411111; -74.073611﻿ (Wilford Wood House) Mountainville Built ca. 1890 in an early application of the Colonial Revival style. One of the rare farmhouses built in Cornwall during its resort period; now owned by Storm King Art Center. (#08000277) 20 Mount Orange Rd. 41°21′22″N 74°16′41″W﻿ / ﻿41.356111°N 74.278056°W﻿ / 41.356111; -74.278056﻿ (Yelverton Inn and Store) Chester Wooden 1765 inn entertained Alexander Hamilton and Aaron Burr during local land dispute, in addition to George Washington during Revolution; 1841 store is rare surviving Greek Revival commercial building in area. Wikimedia Commons has media related to National Register of Historic Places in Orange County, New York. ^ Sparks, Leonard (August 6, 2015). "Sad farewell to Balmville Tree". Times-Herald Record. Retrieved August 5, 2015.